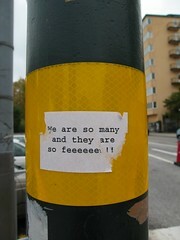 We are so many, and they are so few. In the latest edition of Radio Sandaig the final segment was Teacher’s vs Pupils were a couple of staff take on a couple of children in a pupil generated quiz ( a draw this time). I was encouraged in looking at the ScotEduBlogs news front page earlier today to see that most of the last 10 SEB posts were from pupil blogs. It has always been a worry to me that there are many more teacher’s blogs in Scotland than pupils ones. 186 to 33 in October 2006 according to the scotedublogs wikispace. Of course by this time in the evening the teacher’s are dominant again, but I think this is a good sign as every blogging teacher could support several children’s blogs. I don’t usually ask questions here, but I’d be interested to see how many folk agree with my gut feeling that pupil blogs are more important than teachers ones?